For my next few posts we will be visiting the Garden Route. Along this route there are many beautiful places to visit and I will be highlighting a few of them as we proceed. For those who don't know South Africa or the Western Cape, the Garden Route runs from Cape Town eastwards along the N2 highway and more or less follows the southern coastline of South Africa. It is a lovely area to visit and has many rivers, beautiful scenery and a number of country towns along its route. For anybody who has not visited the Garden Route this is a part of South Africa you should make an effort to see. 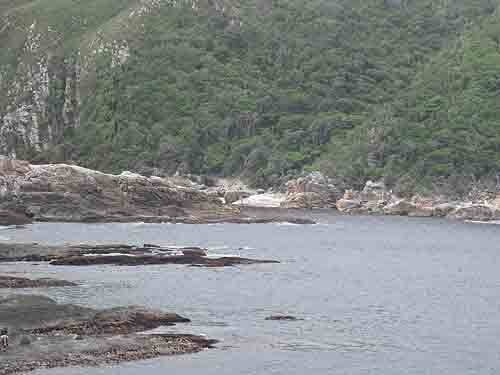 At the eastern end of the Garden Route is the Tsitsikamma with its indigenous forests full of large trees which include species such as the yellow woods, stinkwoods and many other varieties. 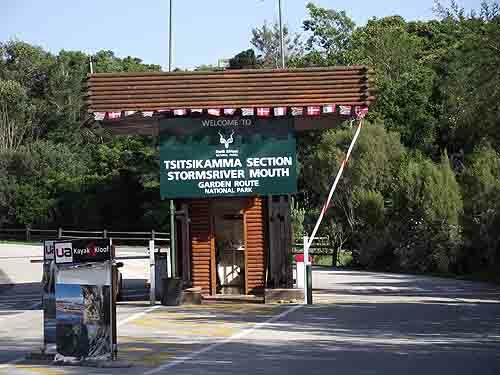 Today we will be visiting the Storms River Mouth in the Garden Route National Park Tsitsikamma section which can be found about half an hours drive east of Plettenberg Bay. The drive from Plettenberg Bay takes you up onto a plateau which winds through forests and farmlands till you get to the Tsistsikamma toll road which is a dead straight road about 13 kilometes long through the centre of the Tsitsikamma forests. The toll road crosses some very high bridges over the Groot Rivier and the Bloukrans river and the Storms River before continuing on to Port Elizabeth about two hours drive away. We however only cross two rivers namely the Groot River and The Bloukrans River. In days gone by the road had to wind its way down the side of the plateau to be able to cross the rivers and these passes are still there today with their winding roads covered by canopies of trees where wild animals such as deer , baboons and monkeys still roam wild. You can often see them under the trees or sitting in the road when you drive through these passes. A year or two ago to avoid the toll road charges one could drive through these scenic passes but unfortunately the authorities have put a stop to that by closing the Bloukrans Pass and forcing motorists to use the toll road to get to the Storms River mouth where we will be heading. About four kilometres before we get to the Storms River bridge (Paul Sauer Bridge) which is its proper name is the turnoff to the Storms River Mouth in the Garden Route National Park. A good tar road from the N2 leads down to the gate of the park where visitors to the park have to pay an entrance fee before being allowed entry. The cost of the ticket is around R30.00 per person although it might be slightly more now as entry fees into the parks have recently been increased. Once we enter the park we drive down a steep and narrow winding road through forests until we get to sea level and can see the India Ocean. The road continues eastwards along the shore for another kilometre or two before we reach the parking areas and restaurant and office facilties of Cape Nature. The mouth of the Storms river is still another kilometre or so further eastwards and this we can only reach on foot. To get to the river we follow a wooden pathway through the forest of trees that grow along the cliff faces as we make our way to the mouth. The views from this pathway to the mouth are spectacular. For those who are not too fit this walk could be a bit much as it has a total of about 500 stairs in one direction and the same 500 on the way back that have to be negotiated. 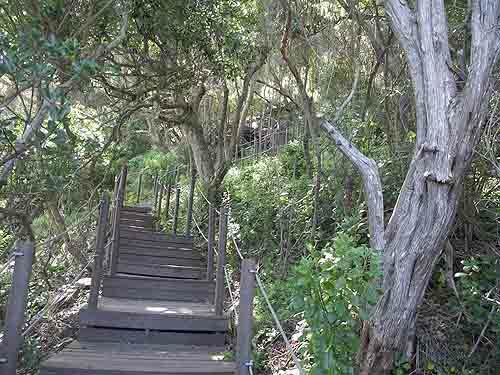 The worst of the stairs is at the end of the outwards walk as one makes one's way down to the various bridges that have been built along the western bank of the river and also across the river. 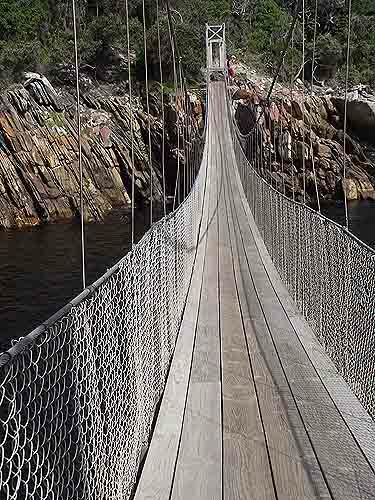 To do this walk one should wear decent walking shoes as flip flops and sandals might prove dangerous on the stairs and bridges. Once at the river mouth a highlight is to cross the hanging bridge and stop in the middle and take photos. It can get pretty scary if someone else gets onto the bridge with you. The bridge which is built on cables strung across the river can get pretty bouncy and nerve racking for those of scared of falling off. I don't think anyone has actually fallen off yet so there is really nothing to worry about. If one looks down into the river one can often spot some of the many fish species that live in the marine reserve inside the park. Seeing some of the shoals of fish will make a fisherman's mouth water all to no avail as fishing in the reserve is not allowed. There is also a small cave near the mouth which can be explored before heading back to the restaurant. Back at the restaurant complex is a small beach for visitors to use and have a swim. 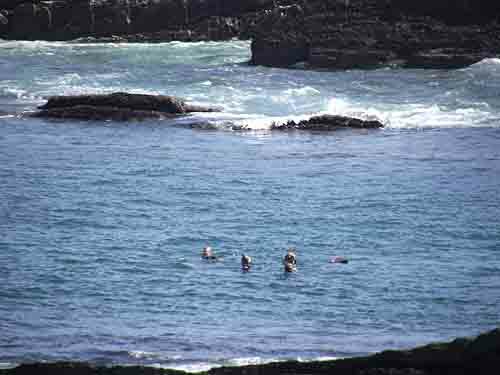 In the summer months Cape Nature places a raft about 30 metres off the beach and encourages swimmers to swim out to the raft and sit on it for a while before swimming back to the beach. 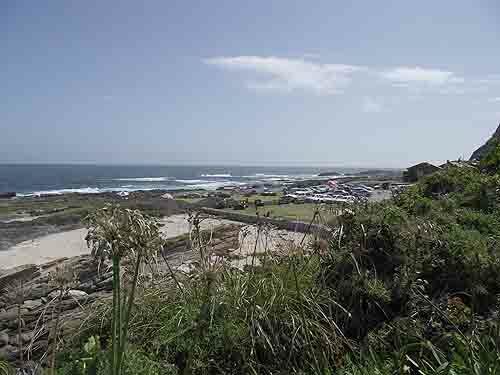 Near the restaurant complex are a number of day camping sites laid out where day visitors to the park can have a braai before heading home after a wonderful day at the coast. Tent and caravan sites are also available for those wanting to stay longer and enjoy nature to its fullest. 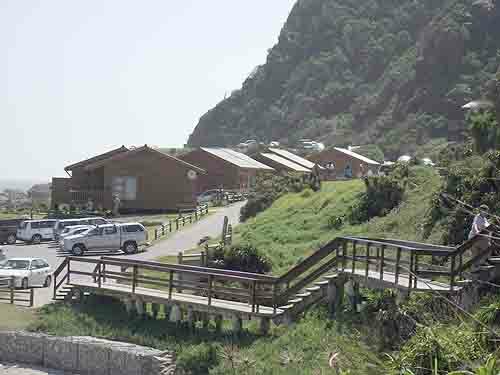 For older folk or those who enjoy their creature comforts there are a number of self catering bungalows known as oceanettes for hire. They come in different sizes and designs. As angling is not allowed within the park Cape Nature has provided some entertainment for visitors to the park. An underwater swimming and diving trail has been set up and people can book with Cape Nature to do this trail under the watchful eye of an underwater guide. They also have a large rubber duck boat which they use to take people on short cruises along the coastline as well as on diving expeditions out to sea. I am not sure whether diving equipment is provided. The main aim of this nature reserve is to preserve the natural trees and forests which abound along this part of the coastline. This park also falls into the Cape Floral kingdom and here you will find many species of plants including the fynbos which includes the protea family, ericas and restios and many others. To show off the biodiversity of the area a number of walking trails have been built through the forests and along the coastline. 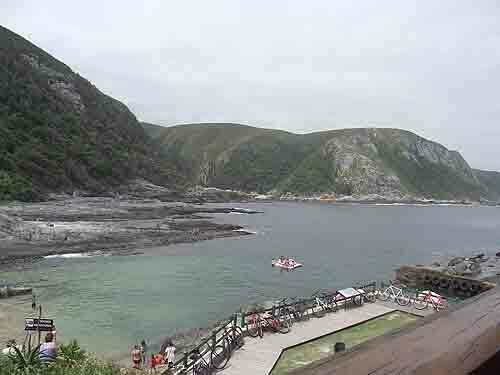 The most well known of these is the otter trail which runs along the coast from the Storms River mouth all the way to Natures Valley in the west. The trail is about 42.5 kilometres long and is walked over 5 days with four overnight stops along the way. This trail includes a number of river crossings which makes for an exciting day especially when the tide is up. The trail is broken into the followings distances to be hiked. Day 1 = 4.8km (± 2 hours), Day 2 = 7.9km (± 4 hours), Day 3 = 7.7km (± 4 hours), Day 4 = 13.8km (± 6 hours), Day 5 = 6.8km (± 3 hours) and is not for people who are unfit as all your food and clothing for the full trail has to be carried with you. There are also many hills to be climbed up and climbed down so the trail can become pretty strenuous. For people who don't want to walk the trails the most strenuos exercise on the day will be lifting your glass in the restaurant to enjoy some of South Africa's best wines. The excitement of the day is not yet complete as on the way back to Plettenberg Bay one can stop at the Bloukrans River bridge and see people jumping off one of the highest bridges in Africa. 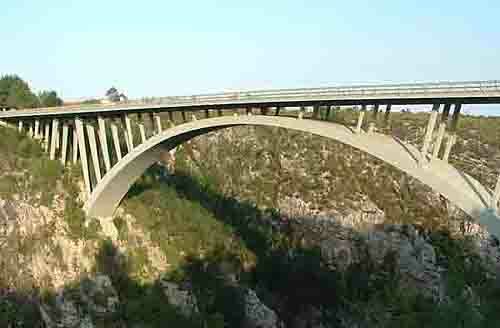 This bridge is well known for its Bungee jumping and has a launching point which is 708 feet (217 metres) above the river which flows directly under the bridge. In my estimation people who jump off bridges must have rocks in their heads because who in their right mind will do something so stupid. Anyway the bridge is there and people offer bungee jumping from the bridge so if you have the time and money and the guts go ahead and do it. It will be a once in a lifetime experience except for those who are stupid enough to go and do it a second time. 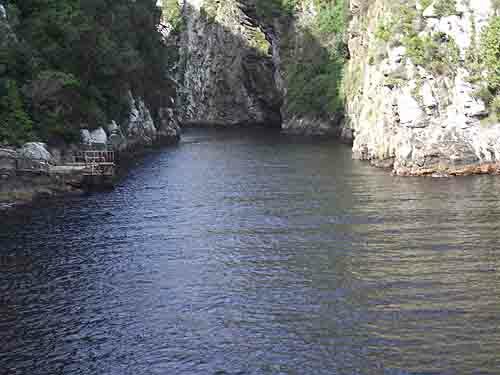 As you can see this part of the Garden Route has some interesting things to do and see.